Genealogy exploration reached its true potential once it was complemented by breakthroughs achieved in genetics. Instead of relying just on sparse historical records, oral interviews, and old documents, you can now map your entire genome and carve a precise picture of your place in history. The very term ‘genealogy’ comes from the words “generation” and “knowledge,” which perfectly depicts the purpose of our guide on the best genealogy tests on the market, allowing you to obtain genetic information about your family and connect with relatives you didn’t even know existed. MyHeritage is a renowned DNA testing company that provides precise results regarding your ancestral genetic origins and complements those findings with genealogical sources. Ancestry is the biggest genealogy conglomerate in the world. AncestryDNAis its integral element aimed toward reaching the ultimate levels of genetic science. It boasts an impressive online community as well. Backed by giants like Google and New Enterprise Associates, 23andMe is on top of the personal genomics field. In addition to exploring your ancestry, you can get a health-related report with your results. Living DNA is an ancestry DNA testing provider that stands out due to its far-reaching geographical coverage, which allows it to provide its customer with extremely precise and detailed results. If you are looking for a DNA testing company related to industry giants with an abundance of different tests and state-of-the-art technology, ,FamilyTree DNA ,earns its wings on all accounts. EasyDNA operates more than 35 offices around the world, making it one of the most international DNA providers available. 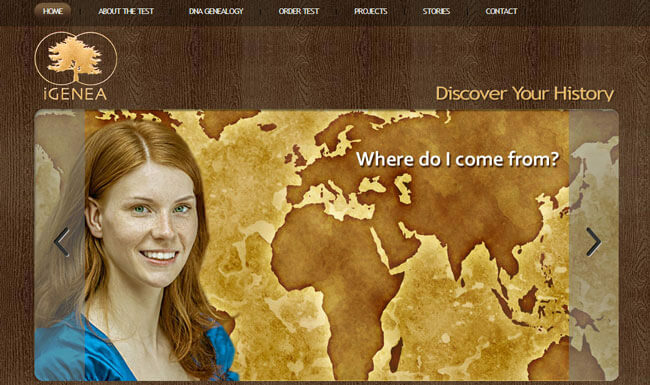 It offers various testing solutions to determine the exact point of your ancestral origins. GPS Origins is an ancestry DNA test created by Dr. Eran Elhaik and sold by DNA Diagnostics Center. The test employs a proprietary algorithm to determine the exact origins of your DNA signature. iGENEA is a European DNA testing company offering a combination of genetic scientific breakthroughs and genealogical research in order to provide an accurate depiction of your ancestral origins. 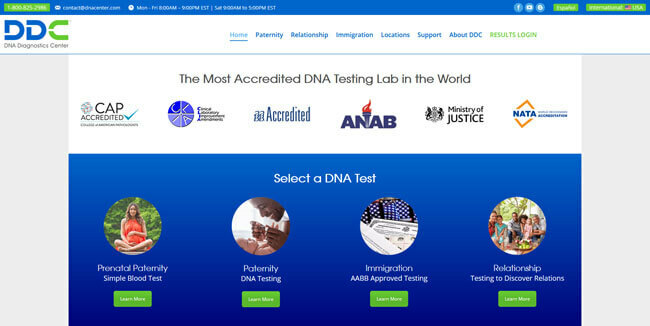 DDC is the most modern DNA testing company on the market with numerous (inter)national certifications, robotics technology, and world-renowned experts on genetics. 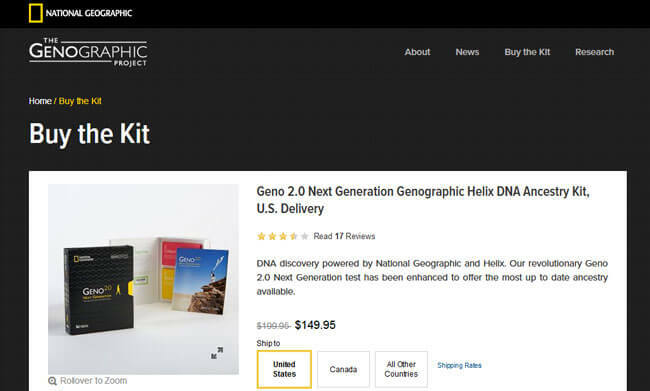 National Geographic's Genographic Project was born out of partnership with Helix DNA testing company. The project's current results count over 900,000 tests executed in 140 countries. Our professional team examined every relevant aspect of the DNA testing companies on our list using an extensive set of pre-determined ranking criteria in order to bring you the absolute best genealogy tests on the market. In the first step of our analysis, we explored the variety of DNA tests offered by all the companies. Further, we proceeded to determine the quality and reliability of the tests with the use of several strict criteria, including the number of checked DNA markers, the size of the database searched, and test accuracy. Additional factors that were taken into consideration included the professionalism of the staff and the quality of the testing facility. Finally, assessing the quality of customer service, we focused on 4 primary factors, including the level of privacy provided, average turnaround times, membership benefits, and value for money. What follows are more detailed reviews of all of our top-ranked genealogy tests. MyHeritage is a reputable ancestry DNA testing company founded in 2003 in Bnei Atarot, Israel, by its current CEO Gilad Japhet, an avid entrepreneur and family historian. The company complements its genetic screening with almost 9 billion historical records obtained to provide optimal insights into your genealogy and genetics. The company’s database currently features more than 2.6 million profiles and over 40 million family trees generated by its users. Up to this point, MyHeritage has helped more than 91 million people in 196 countries discover their genetic origins and connect with unknown relatives. MyHeritage ancestry DNA test costs 99$ and it’s just the first step toward unshrouding your ancient ancestry and the history of your family. MyHeritage currently supports 42 ethnicities, which is the largest number offered by any respectable DNA testing service. The sample processing is performed in Family Tree DNA’s lab and the test checks 690,000 genetic markers in your genome, which guarantees extreme accuracy and reliability. Apart from ethnicity estimates and DNA matches within its database, MyHeritage also features a dedicated tool for chromosome browsing. In other words, you’ll be able to compare your DNA with your newly-found relatives, one chromosome at a time. AncestryDNA belongs to the biggest genealogy conglomerate on the market. There are numerous companies and projects behind the Ancestry brand, such as Ancestry online magazine, AncestryHealth, Archives.com, Family Tree Maker, and others. It also incorporates the largest user database, comprising over 7 million samples collected. Users particularly interested in all fields of their genealogy can also subscribe to the magazine, which features over 20 billion historical records, 700 million names spread across numerous family trees, and around 200 million scanned photographs, documents, and written stories. The magazine currently has around 2 million paying subscribers. AncestryDNA’s main test is called “Ancestry DNA Test” and it includes autosomal, Y-chromosome, and mitochondrial inspection, all bundled in one. This, however, means that you can’t order just mitochondrial or Y-chromosome tests. AncestryDNA test costs 99$ and the usual turnaround time is between 6 and 8 weeks. It checks more than 700,000 genetic markers, which promises a highly accurate final report. The test also covers 350 world regions and explores your potential Native American roots. The company’s database contains more than 7 million samples, so you’re bound to find unknown genetic relatives. Bonus features include an interactive ethnicity map (allows you to inspect your genetic relatives on a geographical scale, including their permanent settlements and migration patterns), DNA circles (cluster generations with relatives found throughout the procedure), and “Map and Locations” map available exclusively to Ancestry Magazine subscribers (designed to pinpoint the birthplaces of your ancestors, reaching up to 10 generations in the past). AncestryDNA’s shipping capabilities currently cover 35 countries around the world. With strong backers like Google, Genentech, New Enterprise Associates, and others, 23andMe has had the resources necessary to dive right into high-level genetic research from the start. 23andMe is the only company on our list offering health-related results alongside the autosomal ancestry DNA test. 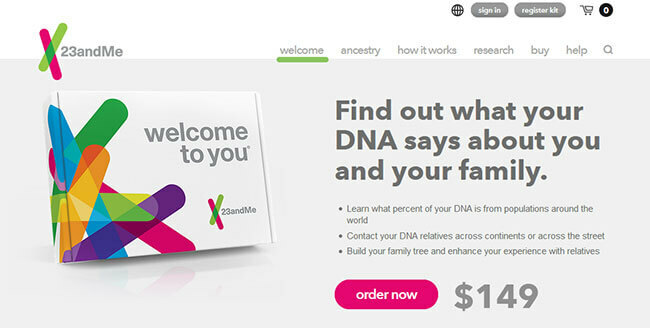 The main test is simply called “Ancestry Service” and it comes with the price tag of 99$. The genetic health add-on costs 100$ extra and is entirely optional. 23andMe was the first company ever to receive an FDA approval for its health-related direct-to-customers DNA testing kit. 23andMe allows you to match your unique DNA signature against 31 known sample populations across 150 regions of the world. The exploration of your genetic heritage will uncover the origins of your DNA strain and provide you with ancestry timelines. You’ll receive information concerning your haplogroup and Neanderthal DNA leftovers, indicating the first ever bearer of your DNA and percentages of your genome inherited from your Neanderthal ancestry, respectively. If you also opt for genetic health testing, you can expect the final report with 8+ genetic health risks, prerequisites for 41+ different health conditions, 19+ personal traits, and 7+ wellness traits. Living DNA is by far the youngest DNA testing company on the list, being founded just two years ago. However, its father company is DNA Worldwide Group, which has been one of the major players on the market since 2004. DNA Worldwide Group established its fresh platform through co-operation with hundreds of renowned scientists, researchers, and genetic experts, as well as Family Tree DNA and Scotland’s DNA. What differentiates Living DNA from all similar companies is its thorough world coverage. It examines 80 regions of the world, searching for the origins of your ancestral line. It also offers the most detailed coverage of the British Isles, represented by 21 different regions. Living DNA Ancestry Test doesn’t separate autosomal and lineage testing, employing the widely accepted 3-in-1 approach. The test costs 159$ (expensive, but with frequent discounts). For the price, you can expect the examination of 650,000 genetic markers in your genome, precise geographical information, and ethnic coverage reaching thousands of years in the past. The average turnaround time is between 10 and 12 weeks and the report also includes the “Back in Time” map, which provides a comprehensive and detailed historical outline of your genetic ancestry. Living DNA still doesn’t allow matching with found relatives, but it promises this possibility in the near future. Family Tree DNA was born in 1999, when Gene by Gene corporate conglomerate made an executive decision to isolate its genetic genealogy department. By that time, the father company gathered more than ample experience with over 5 million tests executed. Family Tree DNA is a DNA testing company with the broadest offer of separate ancestry DNA tests on the market. Besides its signature autosomal test called “Family Finder,” it also provides Y-chromosome and mitochondrial tests. The difference lies in the number of genetic markers tested. Y-chromosome tests can check 37, 67, 111 or 500 DNA markers, providing ultimate accuracy and going up to 340,000 years into the past. Mitochondrial tests come in HRV1 + HRV2 and full sequence iterations. They reach up to 180,000 years into the past. Every test with Family Tree DNA allows you to connect with your newly-found matches, access experts on your genetic lineage, be a part of group projects, update your results free of charge, attend free webinars held by professional genetic genealogists, and solve any potential issues through personalized user support. The “Family Finder” DNA test costs 79$ and explores autosomal chromosomes. It inspects more than 690,000 single nucleotide polymorphisms. Your genetic signature will be compared to more than 500,000 samples in the company’s database in order to find potential genetic matches. Apart from tracing your lineage throughout history and uncovering geographical areas of your genetic impact, you will also be able to compile your personal family tree. The proprietary Chromosome Browser tool will enable you to compare your DNA to that of your newly-found relatives on a chromosome level. A nice bonus feature includes a graphic representation of the migration routes of up to 16 generations of your ancestors. The average turnaround time is between 4 and 10 weeks and you can download your raw data file and use it with other companies to look for potential relatives in their respective databases. EasyDNA is a truly international DNA testing provider with corporate offices in 35+ countries all over the world, from the US to Angola and Zimbabwe. The company has executed more than 300,000 DNA tests, always striving to optimize its service and user experience. EasyDNA received the WhatClinic’s Customer Service Award two years in a row, in 2013 and 2014. EasyDNA testing laboratory is ISO 17025 certified, which means its staff possesses the technical skills and qualifications and its equipment is quality-tested and calibrated. The system used for sample processing is called “PowerPlex 16” and it comes with a 99.99% accuracy guarantee. The company offers GPS Origins ancestry test (229$) and Ancestral Origins (229$) but also allows you to explore your direct maternal (189$) and paternal (169$) ancestry. You can also get help from a professional genealogist in researching numerous sources leading back to your ancestors. GPS Origins checks 800,000 genetic markers and covers 41 world regions with 1,000+ reference populations taken into account. The results will provide insight into your exact genetic origins over 1,000 years back. Ancestry Origins utilizes the GeoGenetic test to determine your ancestral background, delving deeper into your genetic heritage by exploring 14 distinct anthropological regions. Your personal DNA ancestry map will feature strength indicators, native region matches, and population matches. The final report is usually generated within 2 weeks. Direct maternal and paternal ancestry tests will examine your Y-chromosome (men only) and mitochondrial DNA. This will allow you to receive a complete picture of both your mother’s and your father’s sides of the family. The average turnaround time is between 4 and 5 weeks. GPS Origins is one of the most famous genealogy DNA tests on the market, owing much of its reputation to the fact that it was developed by DNA Diagnostics Center (DDC). Created with the aim of providing users with the most accurate report of their genetic origins, it has earned the trust of thousands upon thousands of people worldwide. One of its main strengths is that it can actually identify the exact place where your DNA line began. While DDC may not require a long introduction, it is important to note that it is among the leading genetic DNA test providers in the world, renowned for its use of state-of-the-art technology and robotic sequencing, which guarantees absolute precision. DDC was established way back in 1995, maintaining its place on the market for more than two decades now, which does speak a lot about the way the company handles business. It was among the first to provide the general public with DNA services that make use of the latest scientific breakthroughs. All of these features have also helped GPS Origins become the test it is today. The brainchild of Eran Elhaik, who works at the University of Sheffield and the Johns Hopkins School of Public Health, this test can truly meet all your genealogy DNA testing needs. Like many similar tests, this one also allows you to collect your DNA sample at home. After creating an account and filling out a questionnaire on the website, the DNA test will be sent to your home address. All you then have to do is perform a buccal swab to collect your sample, place it in the pre-paid envelope, and send it back. After 4-6 weeks, DDC will finish your report, which you can either read online or download to the device of your choice. iGENEA is a DNA testing provider founded back in 2006 with corporate headquarters in Switzerland. The company’s founder Joelle Apter holds a master’s degree in both genetics and anthropology and has created iGENEA on her quest to uncover the Jewish/Polish origins of her ancestors. She is also the founder and CEO of Websheep and GenePartner. Like AncestryDNA, iGENEA strives to create a symbiosis of genetic and historical (genealogical) research in order to obtain more information about humans as a species. iGENEA collaborates with Family Tree DNA and utilizes its processing facilities, laboratories, and databases. The company offers 3 at-home testing solutions tailored to fit different needs and expectations. iGenea Basic (179€) will present your ethnic origins on a world map (around 2,000 years back), allow you to find genetic relatives, and provide you with a written report with a certificate in a noble picture frame. iGenea Premium (499€) will also include your haplogroup & ancient tribe + paternal OR maternal lineage (around 1,000 years back). Lastly, iGenea Expert(1299€) will allow you to inspect BOTH maternal and paternal lineages, discover even more relatives, and receive the most extensive testing on a world scale. Your initial results should be ready 6-8 weeks after the laboratory receives your sample. Depending on the actual option you’ve chosen, these can be your final results or they can be sent for further analysis. Raw data can be downloaded as well once the results are finalized. iGENEA tests check 500,000 genetic markers and focus on European ancestry and origins. DDC focuses more on immediate family relationships but also offers ancestry and animal DNA testing solutions. The sheer amount of tests in its portfolio is truly staggering and they are all performed by world-class experts in the field of genetics. Every test is executed twice, so there’s no room for potential errors or test failures. DDC also offers free pre-test consultations to determine the best option for you. This may come in pretty handy if you are not sure which testing solution is just right for your needs. Once the results are completed, they are reviewed by a highly-skilled Ph.D. as the final quality assurance of the service provided. The DNA testing provider owns its own testing laboratory, which incorporates the newest generation of DNA testing technology, including robotics technology. This makes it the most modern and hi-tech testing facility currently on the market. The prices vary, depending on the test you opt for, but there are payment plans available for the most expensive variants. You can always contact its support center to find out more about those plans and make an arrangement that will benefit all the parties involved. That kind of financial flexibility is not often seen in the corporate world. Apart from offering a multitude of tests, DDC also differentiates between legal and non-legal iterations. This means it provides tests that can be used in court proceedings, immigration disputes, and other matters that need to be handled in front of state-sanctioned institutions. Tests with court-viable results are more expensive, but as we said, payment plans are always available. National Geographic has spent more than a century researching the genealogy of the human species. In 2005, its executives realized genealogy can only reach so far. They also realized the future benefits of complementing genealogy with genetic research. That’s why they established a partnership with Helix DNA testing company and developed National Geographic’s Genographic Project. The Genographic DNA test allows users to discover fundamental information about their deep ancestry, ranging up to 200,000 years in the past. The project already amassed more than 900,000 users from 140 countries. The price of the test is 149.95$ plus shipping costs. Note that, once you receive your personal at-home testing kit, you’ll have to register it on two sites, National Geographic and Helix. The test checks 200,000 genetic markers. The Y-chromosome test checks 10,000 SNPs while the mitochondrial test checks 3,000SNPs. Ordering the test also gives you full access to various Helix apps. The test takes into account 60 reference populations for a precise picture of regional ancestry. Once your final report has been generated, you’ll be able to inspect it on your personal ancestry results dashboard. It’ll show your deep ancestry results that reveal the anthropological story of your ancestry – how your ancient relatives lived and migrated. It’ll also indicate how your ancestors interbred with other hominin species after leaving Africa around 60,000 years ago. Finally, you’ll receive your unique regional ancestry makeup and potential genetic matches with famous historical geniuses. The first step for a smart investment in DNA testing is defining developing a clear list of priorities your ideal test should satisfy. Once you know exactly what you’re looking for, choosing the right company for the job is just a matter of having adequate information. Our list of the best genealogy tests can help you make a decision when you determine your specific expectations. As for our selection process, it was a long and comprehensive one. We took into consideration several important criteria that can reveal what you can expect from each of the companies on our list. Our criteria include the scope of the DNA test(s), processing times, privacy and security, value for money, and overall experience. All of these criteria are of vital importance when making your decision because only when they are all met can you rest assured that you will receive the type of service you deserve. The scope of the DNA test is a key factor because it shows you what the test covers and what the final report will include. When doing a DNA test, you want your results to be ready as soon as possible, which is why processing times are another crucial factor. As you are giving your personal information to the DNA company of your choice, you need to have peace of mind that your data is safe and secure at all times and that no third-party can access them. Value for money and overall experience may be the most significant criteria because you want to receive the best, stress-free service without burning a hole in your pocket, which is precisely what all the genealogy DNA testing providers on our list offer.